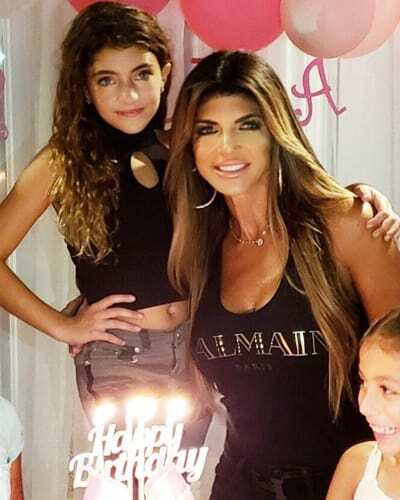 Teresa Giudice: Mom-Shamed for Letting 9-Year-Old Wear THIS! In August, Theresa Giudice was mom-shamed because some of her followers didn’t like the swimsuits that her daughters were wearing. 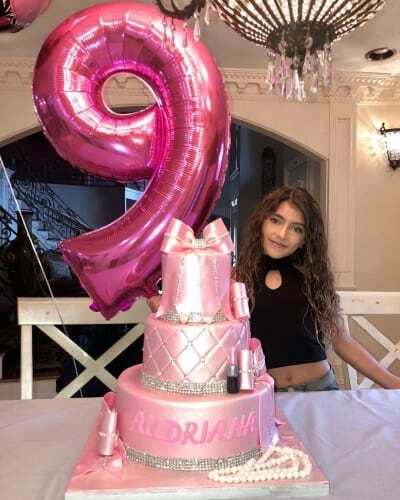 Now, her followers are at it again — because they didn’t like the outfit or makeup that her 9-year-old Audriana wore to her own birthdary party. 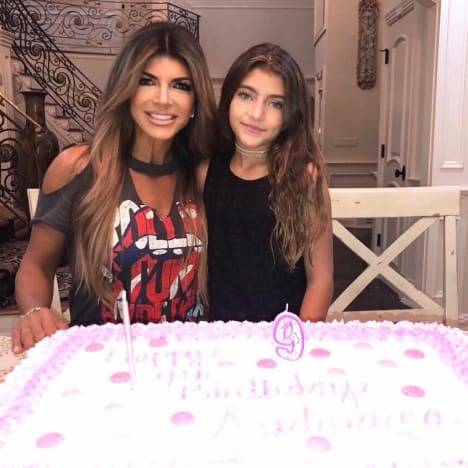 Audriana Giudice turned 9, and Teresa shared multiple photos from both her celebrations with the family and her heading off to a friend’s party. Some of Teresa’s followers zeroed in on Audriana’s (gasp!) navel and her makeup (the horror! ), and hurled some inexcusable criticism at both mother and daughter. Leaving aside whatever feeding her to the world is supposed to mean, there were other mom-shamers. There is literally nothing inherently inappropriate about makeup. In the mean time, another shamer seemed concerned that Audriana was doing too much partying. For the record, it is 100% normal for a child to have a birthday party with family and a separate party with friends. It’s not like Audriana’s clothes have the word juicy stitched into them. They’re fine. “That’s a bit much Teresa,” another wrote in an overly familiar tone. Not that it matters, really, but that was how Audriana dresses to go to a birthday party with friends. In contrast, this photo is of how she dresses on her first day of fourth grade. Both outfits are age-appropriate for those occassions. Some people just don’t remember being 9. Others are full of hate. Fortunately, Teresa did have people commenting in her defense. Ultimately, a lot of mom-shaming like this, where people are concerned about a child’s appearance rather than health, is unfortunately about controlling women. Controlling mothers in the hopes that they will pass down conservative cultural values such as modesty culture. Controlling daughters so that they dress like they’re auditioning for The Handmaid’s Tale instead of in totally reasonable outfits that they like. If a parent is hurting or endangering their child, that is one thing. We all have a responsibility to speak up. Letting their child dress up for a party is not dangerous or harmful. It’s nice. View Slideshow: Teresa Giudice: My Husband Is Getting Deported & I’m Getting Rich! Previous story Jeremy Calvert to Teen Mom Fans: Leave Farrah Abraham Alone!